A mixed media piece based on observations of Kilve beach, north Somerset, craggy cliffs and grasses combine in this expansive view. 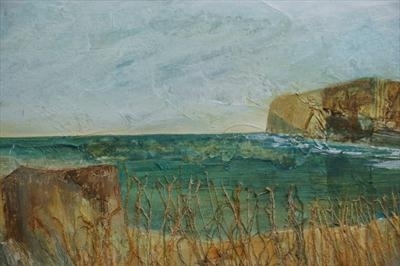 An evocative work from observations of the shore and cliffs, worked in mixed media on canvas with stitched elements applied to the foreground. A calm sea view with atmoshere and presence of place.